Share movements -- or a lack thereof -- show investors aren't sure the takeover will go through as planned. I suspect that the unfortunate reputation of Monsanto (NYSE:MON), whether deserved or not, was behind the flurry of non-financial coverage of the recently announced merger agreement with Bayer (NASDAQOTH:BAYRY). Perhaps because of that, most articles forgot to mention that not all acquisitions are approved by regulators, while others are abandoned by executives months later when the road to approval proves more difficult than originally envisioned. Although regulators have yet to weigh in on the matter, investors appear skeptical that a Monsanto-Bayer merger will occur. There are several good reasons for the pessimism. The deal was announced on Sept. 14. Bayer agreed to an all-cash offer at $128 per share of Monsanto stock, for a total cash payment of $57 billion. Assuming another $9 billion in Monsanto debt would raise the total acquisition price to $66 billion. 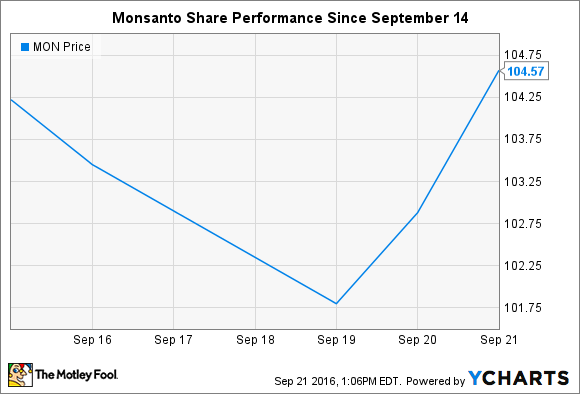 But Monsanto shares have barely budged since the deal was announced and continue to trade well below the $128 offer price. At $105 per share, Monsanto stock is trading 22% below the offer price. Rather than rise closer to Bayer's offer (or at all), shares actually declined for several days after the announcement. Bayer needs to take on debt: ...a lot of debt. At the end of June the company had less than $2.25 billion in cash on hand. Worse yet, it had just $18.4 billion in long-term debt on its balance sheet. To close the deal Bayer shareholders need to be comfortable taking on $57 billion in debt just to buy Monsanto shares, and then an additional $9 billion in Monsanto debt. While the liabilities would be partially offset by adding Monsanto's assets to the balance sheet, the end result is still a weaker balance sheet due to a higher debt-to-assets ratio. Bayer shareholders may not want to take on that risk. American regulators: Perhaps on its own a Monsanto-Bayer merger wouldn't provoke an abnormal level of scrutiny, but regulators aren't dealing with single merger in the agricultural industry; they're dealing with three. And these three involve an overweight distribution of global market share. Dow Chemical Company and DuPont have a pending merger on the table (which was just delayed). ChemChina is still hoping to close its deal for Syngenta by the end of 2016 (U.S. regulators already signed off on it). The high tide of consolidation puts added pressure on regulators, who may rather avoid an overly concentrated industry. European regulators: The same is true for European regulators, although the road to approval is even more difficult when it travels through Brussels. In addition to stricter trust and enterprise laws, all member states of the European Union get to weigh in on the matter. Worse, unlike their American counterparts, they have yet to approve a single merger in the industry. Having three on the table could doom each in the end. The good news is that even if the Monsanto-Bayer merger fails due to regulatory hurdles, Monsanto investors will be $2 billion richer thanks to a reverse antitrust break fee. There's also plenty to look forward to in Monsanto's pipeline, which bodes well for the future of the company. While it's too early to tell when or if a deal will take place, it's clear that investors are pretty skeptical.